I’m told the Panthers are keeping a very strong eye on Reagan Campbell-Gillard. Officials weren’t happy with how he finished the season last year and are hoping for much improved performances this season. Unfortunately he failed to fire in the round 1 clash against Parramatta, again raising a few eyebrows given his expensive, long-term contract. Hopefully RCG finds the form that saw him selected for New South Wales last year. The Pantherettes were back on deck at last weekend’s home game, braving the conditions and revealing their brand new outfits for the 2019 season. With so many clubs following a silly politically correct line and dropping cheerleaders from their match day experience, it’s great to see the Panthers still supporting dancers in the local community by backing the cheer squad. New flags bearing the first grade squad’s names and faces were on display at Panthers Stadium last weekend, but one flag was a notable omission. There was no sign of Tyrone May – who while still part of the club’s top 30, is currently subject to the NRL’s no-fault stand-down policy. The Masked Panther doesn’t like to whinge too much, but can somebody make the clock on the scoreboard at Panthers Stadium bigger? The new-look version is way too small. A moment of madness from Waqa Blake has resulted in him copping a $1,350 fine for Contrary Conduct. Blake pushed an unsuspecting Mitchell Moses over in the 59th minute of last Sunday’s game, conceding a penalty and the wrath of the match review committee. He won’t miss any game time, but is a little lighter in the hip pocket. Good news on the injury front with forward Hame Sele cleared of a broken arm after he left the field early in last Sunday’s clash against Parramatta. Meanwhile, James Tamou won’t miss any game time despite suffering a finger injury in the game. It’ll be monitored but it’s more of an annoyance than anything too serious. Panthers boss Phil Gould is back writing for The Sun Herald. The Gus column was a fixture of the Sunday paper for years, but was cut in early 2017. Last weekend he re-appeared, perhaps related to Channel Nine’s recent purchase of Fairfax Media? 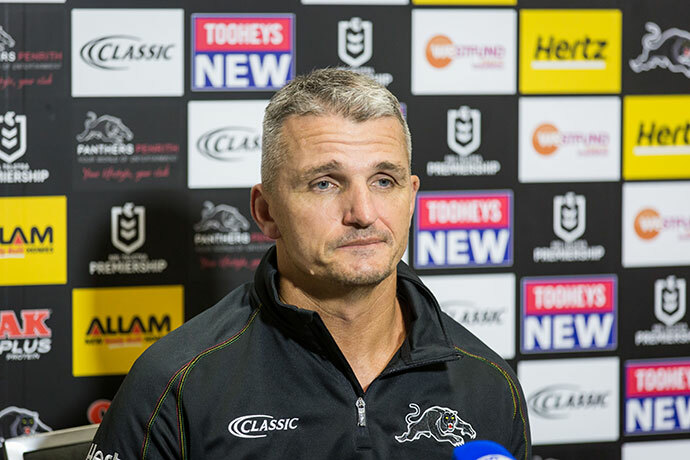 I was a little disappointed to see Panthers coach Ivan Cleary so guarded about his team line-up at last Saturday’s pre-match press conference. Cleary was asked by the media if there was any late changes, to which he replied “not that I’m going to tell you” before hinting he wouldn’t be discussing late mail through the year. Just a couple of hours later, the Panthers released news that Sione Katoa was out of Sunday’s game against the Eels injured (confirming a rumour that had already been circulating anyway). Why not just be up front in the first place, especially given the news was coming out anyway? Spotted: Panthers forward Jack Hetherington having a quiet breakfast at Percy Plunkett last Saturday. Panthers 1991 premiership winner and NSW Origin coach Brad Fittler is the latest high profile rugby league personality to question Penrith’s decision to appoint a leadership group this season instead of a single captain. 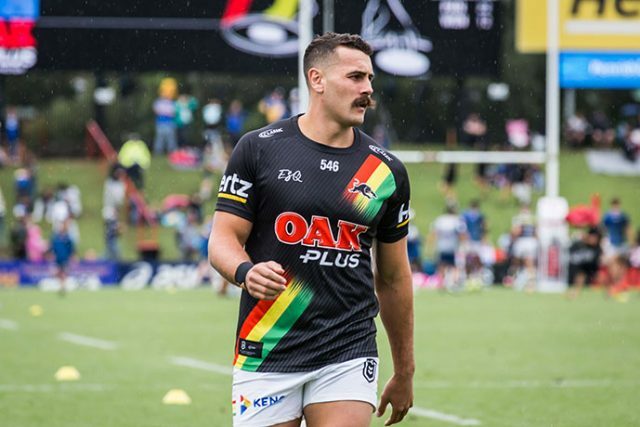 Speaking on ‘The Sunday Footy Show’ last weekend, Freddy questioned the leadership set-up at the foot of the Mountains and suggested the Panthers needed a focused captain to lead the club on and off the field, especially given recent off-field events. There’ll be no early morning sausage sizzle at a local school for the Panthers on State Election day. The players are staying in Newcastle on Friday night, ensuring no travel on game day this Saturday. The Panthers are off to Bathurst next week to take on the Melbourne Storm at Carrington Park, and as always the players will spend plenty of time in the community. The squad will arrive in Bathurst next Thursday and attend a gala day, as well as host a junior clinic at Bathurst Sportsground.